As Pakistan stands poised to be taken over by the Pakistan Tehreek-e-Insaf (PTI)-led government in wake of the results of elections 2018, one of the key question marks is how is the new government going to handle a vulnerable and under-debt economy. Especially when the PTI has promised to create some two million jobs per year in each of its five years in office and Pakistan’s workforce is half of its total population – a staggering 103.5 million. To achieve this objective, Pakistan will have to improve its investment climate and facilitate the business sector, including agri-business which will, in turn, help the growth of not just the industrial but also the agriculture sector. This is where the Doing Business Reforms step in. The PTI’s Prime Minister-designate, Imran Khan, in his victory speech, mentioned how, if they come into power, his new government aims at improving the investment climate, and also mentioned the magic words – Ease of Doing Business. World Bank’s flagship annual report, the “Doing Business Report”, measures what over 190 countries are doing to create an environment suitable for business. It measures the ranking, comparing how fast one country’s business environment is reforming as compared to the other 189, whereas the Distance to Frontier (DTF) methodology helps measure the performance of a country over a period of one year over various indicators. Pakistan’s ranking has been less than satisfactory, having deteriorated to 147 in 2017 from 144 in 2016. However, 147 was a number that seemed to have shaken up the authorities and Pakistan’s relevant government agencies, with the help of technical support from the World Bank, has accelerated Doing Business (DB) Reforms. The realization became actionable and was incorporated in the Vision 2025 of Planning Commission of Pakistan as its Step (Pillar) V to take steps to pull Pakistan up to at least number 50 in the World Bank’s Ease of Doing Business ranking. The 10 indicators being worked on for Pakistan currently are: starting a business; dealing with construction permits; getting electricity; registering property; getting credit; protecting minority investors; paying taxes; trading across borders; enforcing contracts and resolving insolvency. 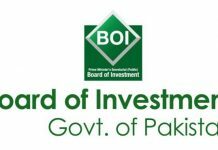 With the Federal Board of Investment (BoI) at the helm of these efforts, having been declared the secretariat for the monitoring of DB Reforms, and relevant departments working alongside in Sindh and Punjab, the DB reforms seem to have gained the much needed impetus. In an exclusive interview with Profit, Fareena Mazhar, Executive Director General at BoI, gives a ringside view of the programme to better the business environment. Ms Mazhar leads the DB reforms initiatives. 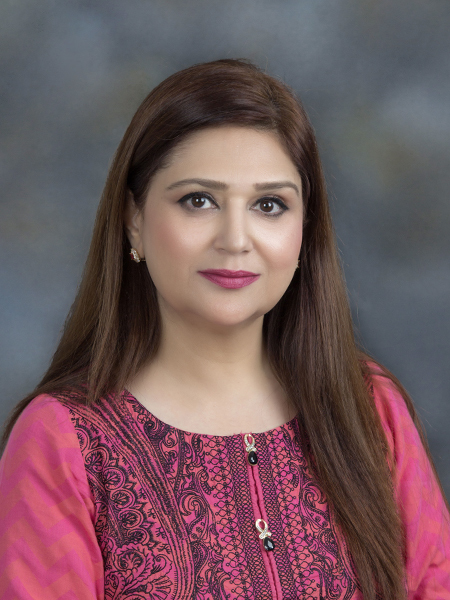 She has been working in the tax department for 32 years now, with around 10 years on deputation in different departments such as the Ministry of Commerce, PEMRA, Prime Minister’s Secretariat, and currently the Board of Investment. In Pakistan’s bureaucratic set-up, a woman having reached this high rank, that too in the field of finance, Ms Mazhar shares that her search for meaning that was a rough road as she refused to tread on the familiar path that would have led her through medical school. Settling on CSS as Plan B, at 21 years of age she embarked on a journey that took her through Inland Revenue Service, marriage with a person in whom she found a good friend, an MBA degree, motherhood of three accomplished children, and the joy of a grandson. In triggering, implementing and monitoring reforms, the role of the top management as a watchdog and arbiter is very important. With the experience under her belt, Ms Mazhar is driving a team, which has a difficult but important task at hand. Q: Why was there a need for the separate EoDB management infrastructure? FM: EODB ranking was till a few years back not given any importance in Pakistan. But we realized that the world was viewing us through this lens. There are about 27 different interdependent agencies/departments, 7 at the federal level and 20 at the provincial level, which are relevant in the context of the 10 business indicators against which 190 countries in the world are evaluated. There was a dire need to have coordinated efforts to achieve the desired objectives. There was no one single agency dealing with EoDB initiatives. It was very important for the reforms to be ‘institutionalized’ at one place. Also, it was felt that unless there was ownership from the top management, the desired results would be difficult to achieve. The current set up where the prime minister is leading the steering committee on EoDB was needed to give a direction and a cohesive plan to all the agencies, both at the national and the subnational level. This also made monitoring of their work easier. Q: Comparisons may be odious, but how would you compare the progress among provinces? FM: The scope of our current work is limited to two provinces – Punjab and Sindh – and they are at par, but we intend to expand the scope of our work to KP and Balochistan as well. With this initiative, efforts gained momentum; relevant agencies are reforming regulations related to business startups, construction permits, land registration and contract enforcement. Sindh’s performance is very important as it [Karachi] has a 65% weightage in the total results towards our ranking, while Punjab [Lahore] accounts for 35%. I have noticed a very healthy competition between Punjab and Sindh in this regard, and the results have been excellent. Q: What have been the roadblocks? FM: In Pakistan, commercial risks are not very high but rewards are. However requirements of obtaining permits and clearances from different government agencies at national and local levels were a cause of delay and frustration to investors. Similarly, foreign firms couldn’t borrow more than their equity capital etc. Other deficiencies in most of the infrastructure services and multiplicity of taxes were some of the challenges and roadblocks, which I think were hampering the investment inflows. We have tried to remove the bottlenecks through effective coordination and streamlining the administrative procedures and introducing automation in each business area. The business environment in Pakistan has improved but the slow implementation of approved policies and weak check and balance systems are yet another set of problems that reflect poor management and governance at various level. Q: How does the investment and business climate facilitation work? FM: Many researches have pointed out two things that can improve a country’s economy and give it a competitive edge. First is the business environment and second is the infrastructure. An enabling and conducive business environment is put in place when government facilitates the businesses. So an improved business environment is expected to yield more local and foreign investment. The aim is to make our country competitive by giving investors an excellent business environment. Q: Please share your experience and involvement in the project? FM: I have an experience of serving in different government departments including FBR and Ministry of Commerce. This gives me an advantage of having a background knowledge and insight in these issues. I have actively taken up the coordination and communication work and have visited every implementing agency and attended every meeting to monitor the performance at federal and provincial levels. Q: What were the main bottlenecks identified that you think led to Pakistan’s low ranking till now? FM: The main bottleneck was to make these departments realize the importance of this initiative and to build a consensus that these tasks were important, not only in the context of changing our perception to attract investment but also about bringing about a real change in the business climate. This would not only improve our ranking in the EoDB index, but will also facilitate the businesses, especially small and medium-sized Enterprises (SMEs). I appreciate all agencies for their support and tireless efforts. The biggest challenge however is to plan ahead for the activities of the next year to keep the momentum going. Q: What steps have been taken to propel the EoDB Reforms? FM: The main step is the constitution of a steering committee headed by the prime minister to introduce and take some urgent steps with a view to improving Pakistan’s investment climate and its international creditworthiness. Similarly, working groups at the provincial levels led by provincial chief secretaries have proven to be very fruitful. We now have a formal reporting structure, coordinated with regular meeting and monitored by an online dashboard along with websites open to public to look at our work. Q: How about the assessment of the success of these reforms? Is there a visible difference in operations? FM: We can measure the performance of our first drive; we implemented 87% of the reforms. Coordination has improved by making provincial working groups. The involvement of the top leadership at various levels has ensured a healthy competition between different agencies as they want to be the one with the most reforms. I am quite confident that these reforms will facilitate business startup, improve security of title by streamlining land and property procedures, improve access to credit through expanding availability of credit information and enhancing secured lending framework, improve contract enforcement through enhancing judicial case management and capacity building of judiciary, facilitate cross border trade and improve tax collection through enhanced tax administration. We can see a lot of difference in each area of business cycle. We follow our own time line, a year-long process where we push out the reforms, make sure that they are used by a maximum number of customers, and then we report it to the World bank to make an independent assessment. The first 100-day Sprint 1 yielded excellent results. Setting up short-term targets that expand into an annual plan is a good strategy. Q: Are the beneficiaries of these reforms aware of the new measures and are they taking advantage in adequate numbers? FM: We have gone into a rigorous communication drive on all forums, including both social media and print media. However, it will take a while before the audience of reforms experience a change in service delivery and recognize the efforts of the government. Our communication strategy is two-pronged and covers communication within the government departments as well as with the general public and direct beneficiaries of reforms. We would like to extend the outreach to all companies already operating and also those interested in starting a business, including women. Q: Do you see the new government also coming on board to this agenda? FM: Improving the business climate is a national agenda and I am sure the new government will keep it as a priority area. For countries like Pakistan improved state-business relations and better investment climate helps businesses to thrive in local and international markets. Industrial development through investment is the need of the day for Pakistan to address poverty and unemployment problems, so it will remain on top of agenda for every government. Imran Khan has talked of DB Reforms to attract investment in the country as one of the top priority areas for his government. 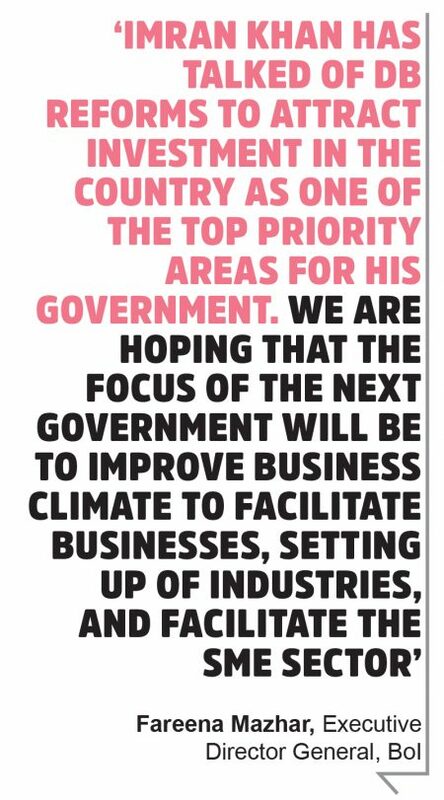 We are hoping that the focus of the next government will be to improve business climate to facilitate businesses, setting up of industries, and facilitate the SME sector.